Drywall has different sheet sizes for different products. It also has different thicknesses. For a patch or remodel project, getting the right size is important. 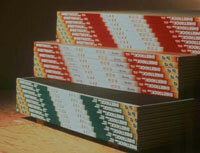 Below you will find a listing of all of the drywall sizes, weights and thicknesses available for common drywall types. See the on 'Types of Drywall' below for information on the various kinds of drywall products you may need. Are you involved in drywall repair project? See the articles 'Drywall Patching', 'How To Cut Drywall' and 'Taping and Mudding Drywall' for information on installing drywall products. Confused about about whether you have 'Drywall' or 'Sheetrock'. See the article 'Sheetrock vs Drywall' for an explanation. Drywall sizes matter when you go to do a drywall repair or project. First you need to get enough material. Then there is the weight. Yes you can get a 12' sheet, but can you handle it to install it? Drywall also comes in different thicknesses. Why, you might wonder. The type of drywall and the application affect the thickness. So why do we have different drywall sizes? One reason is the joints. Drywall joints and seams need to be finished with tape and mud. Using longer drywall can reduce the number of joints. In commercial buildings, drywall is installed vertically. A length is selected that will be long enough to reach the ceiling without any joints. The thicker you make drywall the stronger it is. This is especially important in horizontal applications like ceilings. Drywall that is too thin will sag over time, producing an unsightly appearance. This article on drywall sizes is a resource. It is intended to provide basic information. We do not classify this information as a repair. Therefore, the Common Sense evaluation is not included. Instead we provide you with facts about sizes and types of material that you will use. Drywall is manufactured on continuous feed lines. It is cut to length after toward the end of the line. So in theory there is no limit to the lengths for drywall. There are however, practical limitations. Handling and weight being two important ones. Drywall can be special ordered in any length you want up to twenty or so feet long. The down side to this you have to buy one or more full semi loads to get it specially cut. Not practical for a home owner. For most of us, staying with the standard lengths is our lot in life. Getting the right size sheet will minimize joints and make the job easier. 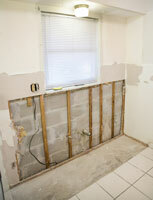 The repair in the picture could be completed with one sheet of drywall, provided you get the right size. Handling drywall can be a problem with larger sheets. You have two main issues. One is being able to physically lift and install a large drywall panel. Even with help this might be challenging. The other is getting it into the spot you need it. Getting drywall around corners, up or down stairways and through door openings will pose problems. If you are replacing damaged drywall you can cut a hole and then use a tape measure to check the thickness. Otherwise you may need to check at a plumbing or electrical penetration. Exercise extra care when checking thicknesses for garages and ceilings. This is where thicker drywall may occur. Another thickness issue is plaster walls. You may run into walls in your home that have rock lath and plaster on them. Rock lath is a type of drywall that is 3/8" thick. Another 3/8" to 1/2" of plaster is applied over the rock lath. This leaves you with a material that is thicker than most standard drywall. See the article 'Plaster Wall Repairs' for more information. 1/4" Drywall - This the thinnest drywall you can buy. It is not a good idea to use this drywall by itself, it is too weak to provide much support. It is ideal for going over other surfaces. Laminating new 1/4" drywall over badly damaged areas can be an easy way to solve a drywall repair problem. Another use is in curved applications. This drywall bends easily and can wrap around curved walls. Normally you would use two layers of 1/4" drywall in lieu of one layer of 1/2" drywall. Drywall Sizes: 4' x 8' Sheets - This type of drywall is usually only available in one size. Availability - The big box home supply stores do not usually stock these drywall sizes and thickness. Drywall supply stores do have it in stock. You can find one in the phone book. 3/8" Drywall - Several decades ago, 3/8" drywall was the standard thickness. Now it is used where the particular thickness is needed. It can also be used to laminate over existing walls and ceilings. It is proportionally lighter than its 1/2" and 5/8" cousins, but also not as strong. It could be used by itself on walls, but this in not recommended. It should not be used on ceilings in most situations. Availability - This thickness is available at most home supply and drywall supply stores. 1/2" Drywall - This is the most popular thickness of drywall. It is likely that the majority of drywall in your home is this thickness. It can be used for walls and ceilings. It comes in regular, moisture resistant and fire rated varieties. 1/2" Drywall now comes in a 'Light Weight' version from most manufacturers. The light weight product can be 25% to 30% light than the standard version. It is a good idea to check on the thickness you need before purchasing drywall. 1/2" will likely be correct most of the time. Drywall Sizes: 4' x 8', 9', 10', 12' and 14' Sheets - This thickness of drywall comes in several standard lengths. It can also be ordered in special lengths (quantity restrictions apply). Availability - Thickness is available at most home supply and drywall supply stores. Home supply stores usually carry 8' and 12' lengths. Drywall supply stores will have other lengths. Most home supply stores now carry the light weight drywall in this thickness. For more information on cutting and installing drywall or sheetrock, see the article 'How To Cut Drywall'. 1/2" Cement Board - The thickness of the cement board used normally matches the thickness of drywall. Most of the time this will be 1/2" in a residential home. Cement Board Sizes: 3' x 5', 4' x 8' Sheets - These are the common sizes for cement board. Cement board was originally intended for use as a tile backer board. The 3' x 5' size comes from the dimensions of a tub enclosure. Availability - This thickness and the sizes indicated are available at most home supply and drywall supply stores. 5/8" Drywall - This thickness is usually made in a fire resistant form. It is used on ceilings and in garages. It has extra fiber in it that helps it to resist fire. The fibers also make it stronger for ceilings. It is proportionally heavier than 1/2" drywall. 5/8" Drywall now comes in a 'Light Weight' version from most manufacturers. The light weight product can be 25% to 30% light than the standard version. Availability - Thickness is available at most home supply and drywall supply stores. Home supply stores usually carry 8' and sometimes 12' lengths. Drywall supply stores will have the other lengths. 5/8" Cement Board - This thickness of cement board is less common in homes. It is used extensively in commercial buildings. Double check the thickness before you assume you have this size. Availability - This thickness and the sizes indicated are available at most drywall supply stores. Home supply stores do not normally carry these drywall sizes and thickness. For more information on cutting and installing cement board, see the article 'How To Cut Cement Board'. It is possible for you to have four or more types drywall in your home. The different types are used for different purposes. Wet locations like bath rooms and showers need materials that resist moisture. Garages usually need fire code drywall. Regular Drywall - This is probably the most common type you will find. It is used on most of the walls and ceilings. It is made of a gypsum core sandwiched between two layers of heavy papers. This type of drywall is the easiest of all to cut. Available Drywall Sizes: 1/4", 3/8", 1/2"
Firecode Drywall - This drywall is thicker than the half inch material. It also has a special gypsum core that resists heat and provides fire protection. The heavier fibrous core is harder to cut but still possible. Available Drywall Sizes: 1/2", 5/8"
Cement Board - A further step in moisture resistance. This is not drywall at all (drywall is made of gypsum, cement board has no gypsum in it).It is made by sandwiching a special cement core between two layers of fiberglass mat. This type of drywall is used behind ceramic tile and marble for high moisture areas. This material is the hardest of all to cut. The types of drywall listed above may be found in your home. Many homes only have one or two kinds. Don't be shocked if you find something you are not familiar with. When doing a repair, you want to make sure you are getting the right thickness and type that you need. Now that you know all of the drywall sizes available, you will be ready for your next drywall repair project. All you need now is some information on working with drywall. See the article 'How to Cut Drywall', for information on cutting drywall. The article 'Taping and Finishing Drywall', has information on finishing the seams. For bigger pieces of drywall you should get help. It's not worth putting you back out for a drywall repair. Keep in mind the drywall size that you need and can handle when purchasing the material. Get some help when you got to install the drywall, it will make things a lot easier.